When the state's new truancy law takes effect Sept. 1, students will no longer potentially face criminal sanctions for skipping school. But there are new directives for public schools and the courts. This story is part of our 31 Days, 31 Ways series. When the state's new truancy law takes effect Sept. 1, students will no longer face criminal sanctions — penalties that could include jail time — for skipping school. But there is likely to be more pressure on schools — and on parents, who could face more cases if their kids fail to show up for class. "I anticipate an increase in prosecutions of parents under this new statute," said Ryan Kellus Turner, general counsel and director of education for the Texas Municipal Courts Education Center in Austin, which helps provide training on municipal court procedures. Both the education center and Texas Education Agency officials have spent the summer trying to chop the bulky House Bill 2398 into serviceable bites for educators and judges who face a dramatic shift this fall in the way they deal with chronic school skippers. That shift includes a new requirement for all public schools to implement truancy prevention programs and new directives on how the courts can penalize school skippers. For years, Texas was one of two states that made truancy a criminal violation. Public school students who had at least 10 unexcused absences in a six-month period found their truancy cases heard by justices of the peace or municipal judges. Schools also had the option of sending students with three unexcused absences within a four-week period to the adult courts. Under the old law, students could see fines as punishment. But those 17 and older who failed to pay those fines could be charged with contempt and, in some cases, wound up in adult jails. For example, 21,576 truancy cases were filed so far this year in Dallas County. Of those, three students were jailed for failing to comply with the judge's orders. Under the new law crafted this year by state Rep. James White, R-Woodville, and state Sen. John Whitmire, D-Houston, schools can no longer send students with three unexcused absences within the four-week period to truancy courts. Instead, school officials will notify parents of the absences and warn them of the consequences, which could be a fine or a loss of driving privileges if the student racks up more absences or a criminal complaint against the parents. In addition, a face-to-face meeting between the school officials and the parents will be set up, and the student must be enrolled in a truancy prevention program. Starting Sept. 1, schools will have some kind of truancy prevention program in place that will probably come in the form of mentoring and counseling. 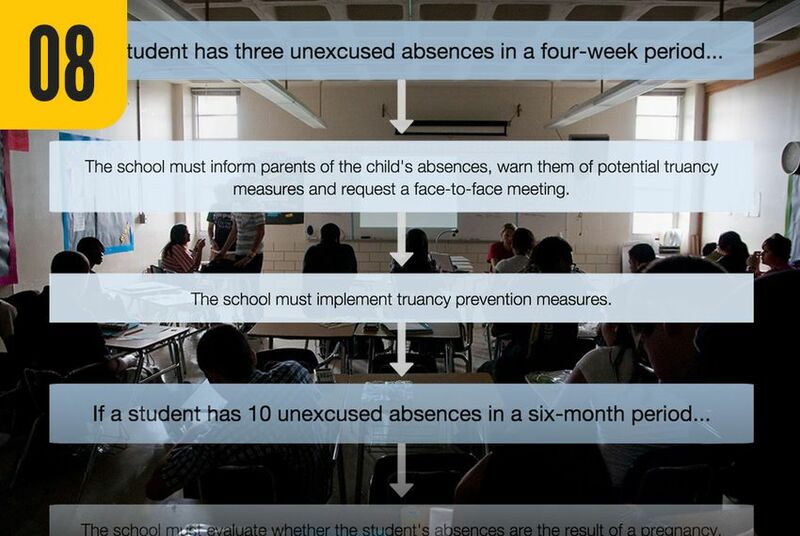 If a student age 12 or older has 10 unexcused absences in a six-month period, school officials must first must determine if the absences are because the student is homeless, pregnant, in foster care or is a primary earner for the family. If the student's situation matches any of those categories, then the school is to offer counseling support. If the student does not fall into any of those categories and the anti-truancy programs have not worked, the school can refer the child to truancy court, where the student can face a $100 fine, a loss of driving privileges and perhaps a referral to the juvenile court system. Like the old law, the new one allows schools to file a criminal complaint against a parent, but only if school can prove the absences were the result of the parent's negligence. Negligence in Texas is defined as deviating from the "normal standard of care." In such cases, parents will face a maximum fine of $500. Turner says parents could see more criminal complaints if courts believe that a student's legal guardian is not helping get that child to school. "Even under this new law, the parent contributing to nonattendance is still a misdemeanor," Turner said. But the Texas Education Agency notes that a court now can dismiss a charge against a parent of contributing to the truancy if a judge finds that the dismissal "would be in the best interest of justice" and the student is unlikely to continue skipping school or has a good reason justifying the absence. White, the original bill sponsor, said parents need to take school attendance seriously. School attendance is mandatory in Texas, and that does not change under this new law. The only thing that does change is a shift from court referral to earlier intervention by schools. "This piece of legislation marks a serious paradigm shift by lawmakers," Turner explained. "Under the old law, the message from the Legislature was we want these cases prosecuted and we want these kids in court."